The Scoop: Linx Dating has become one of the top Silicon Valley matchmaking firms by refusing to settle for anything less than unparalleled excellence. Esteemed celebrity matchmaker Amy Andersen founded the company in 2003 to give high-caliber professionals a more private, premium, and proficient alternative to dating on their own. Over the years, Linx Dating has built a global network of over 25,000 singles who serve as potential matches for a handful of VIP clients. The company’s elite matchmakers vet all clients and date candidates with care to ensure they serve only the cream of the dating crop. Many intelligent, ambitious, and analytical professionals flock to Silicon Valley because it’s the tech capital of the world. It has a reputation as a vibrant, tech-savvy area where careers flourish and fortunes are made. It is not, however, known for its vibrant dating scene. Amy Andersen quit her job at Merrill Lynch to start Linx Dating, a premier matchmaking company, in 2003. However, dating and relationship problems aren’t solved by thinking but by feeling, so a lot of rational, single men in Silicon Valley throw up their hands in despair when it comes to finding love. One 39-year-old tech entrepreneur told Business Insider that he has pretty much given up on online dating. “I have a higher confidence in making another million dollars than I do in finding a spouse,” he said. 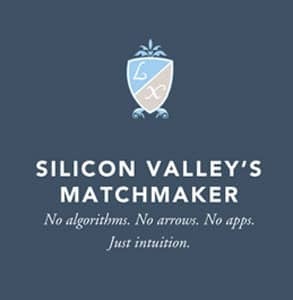 Amy’s job as a high-end matchmaker in Silicon Valley is to help her clients get out of their own way and find a compatible date by tapping into a curated network of singles. She founded Linx Dating in 2003 to up the caliber of dates available to relationship-minded professionals in the Bay Area. Over the last 15 years, Linx Dating has established and maintained an international network of educated, attractive, and sophisticated date candidates as well as premium clients. While Amy specializes in serving Silicon Valley’s dating population, she can reach out to potential date prospects across the country and around the world on behalf of her clients. Linx Dating’s matchmaking services aren’t for everyone. Amy said she targets a specific type of educated, successful, and relationship-minded clientele. She doesn’t cater to the masses or advertise on general channels because she’s selective about who she takes on. Most of her clients come through referrals from a client, her positive reputation, or organic connections. Amy represents only a handful of VIP clients domestically and internationally and no more than 50 premium clients who pay around $35,000 for her services. Linx Dating also has a database of 25,000+ singles who can be matched to VIP and premium clients. The matchmakers also comb through social media and interview hundreds of potential date candidates only to suggest isolate the absolute perfect needle-in-the-haystack match for their clients. Because the matchmaking company’s client base is relatively small, Amy can promise to work individually with everyone she onboards. She does not pass clients off on a junior matchmaker or rely on algorithms to create matches. She recommends and arranges dates herself. Linx fosters an invite-only dating and social network where clients can feel confident they’ll receive the matchmaker’s full attention and advice every step of the way. Some Linx clients have a public or professional reputation to worry about and require a certain level of discretion as they date. These individuals generally choose to hire matchmakers because online dating doesn’t offer enough privacy or hands-on service. Linx Dating’s high-end matchmakers hand-select dates for VIP clients. Amy provides an elite VIP service to accommodate singles who have high expectations and a lot to offer a potential partner. Each year, she sees a handful of VIP clients paired up with someone on their level. Although Linx Dating doesn’t publicize its success stories out of respect for its clients’ privacy, Amy told us she has matched hundreds of individuals in exclusive relationships and marriages over the years. She said none of her couples have divorced, and many have started having children. Amy is even the loving godmother of one Linx offspring! Of course, a handful of VIP matches isn’t a wide enough dating pool for Linx Dating to draw from, so the matchmakers have had to build a diverse and quality database of singles in the Bay Area and beyond. Amy personally interviews candidates who want to join the database and potentially meet one of her high-end clients. Amy estimated that she has hundreds of passive members in her database. These are individuals who have been vetted by the matchmaking team and are now patiently waiting to be paired on dates with VIP or premium clients. Linx Dating also has access to tens of thousands of date candidates in its global network. The matchmakers vet all date candidates before arranging a meeting with a VIP or premium client. Singles can apply to join the database for free — online application takes less than five minutes to complete — and have the chance to meet high-quality dates anywhere in the world. Many singles in Silicon Valley have had incredibly distinguished and successful careers. They’re the epitome of an eligible bachelor or bachelorette, and yet some still struggle to find The One in today’s fast-paced and superficial dating scene. Linx Dating offers a streamlined solution for working professionals who know exactly what type of person they deserve — but just haven’t been able to find that person yet. The matchmaking company’s concierge services and international database can empower VIP clients to take their love lives up a notch and meet brilliant, attractive, and compatible dates without having to go too far outside their comfort zones.